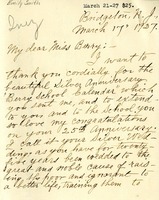 Isabella Stewart, acting principal of Paul Hoffman Junior High School, writes The Berry Schools to let them know that they have received the calendar intended for Mr. Patri. She says that Mr. Patri is on sabbatical enjoying a term's rest but they will save it for his return. 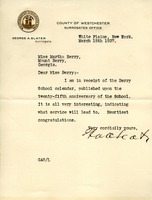 She congratulates Miss Berry on her accomplishment of 25 years. Mrs. Swift sends her thanks for the Berry Calendar. 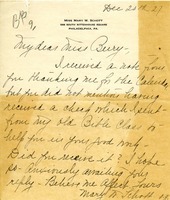 Handwritten note says Mrs. Swift is also known as Alice Catherine Cope. 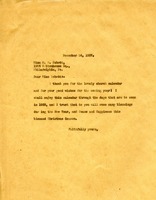 This is a letter from J.W. Sparks complimenting the calendars made by the Berry Schools. The calendars were made of pictures of the schools' campus and buildings. J.W. Sparks sent ten dollars in the interest of their work. Berry Schools calendars, calendar, calendars, gentlemen, J.W. 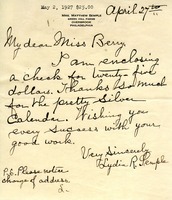 Sparks & Co.
Miss Schottwrites that she has received a thank you note for the calendar she sent, but since it did not mention the check she also sent she wanted to make sure that it had been received too. Mrs. Semple thanks Martha Berry for the Silver Anniversary calendar and sends a $25.00 donation to the Berry Schools. 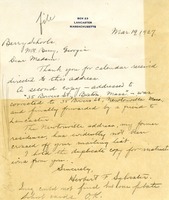 Martha Berry writes Miss M. W. Schott to thank her for a church calendar that she sent. She wishes Miss Schott a blessed New Year and a Christmas season full of "Peace and Happiness." Emily writes to Martha to thank her for the Silver Anniversary calendar, as well as commend Martha on the wonderful cause of raising the poor and ignorant to a better life. Emily notes that it is a glorious life of service worthy of Christ's commendation, she gives a donation to the school as well. Mr. Slater congratulates Miss Berry on the calendar they published for the twenty-fifth anniversary.